During one of my flights, I heard people talking. One of the passengers asked for bread, and the flight attendant asked that if the passenger was Turkish. The passenger asked how they knew, and the flight attendant answered: "Because you asked for a second piece of bread. You Turks like bread very much." There's nothing to say, Turks never feel full without eating bread. Wheat and its products have served as the basic nutrient in almost every corner of the world throughout history. Especially in the Middle East, wheat is master of the cuisine. Wheat is grown all over the Middle East. 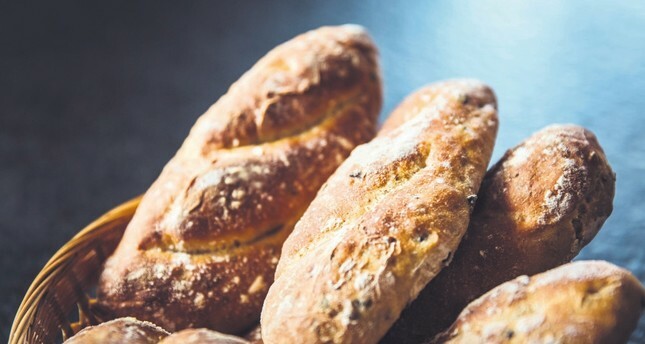 Bread is not only made from wheat, but also from barley, rye and corn. However, wheat bread is often considered superior to all other types of bread. In the Middle East, there are various types of bread varying in shape and cooking methods. Cooking one's own bread at home takes mastery. Especially in extraordinary situations such as war, it is a great advantage. Even at times when bread was exchanged for tickets during World War II, people in Anatolia enjoyed their bread as much as they wanted. Bread is eaten with almost every meal. The "papara," made from pieces of dry bread and milk or broth, is a breakfast preferred by the poor. The bread is laid on eggs and fried in oil so that an easy dish is prepared. When wheat was rare and precious, wheat bread used to be consumed by the rich, while barley and rye bread were what the poor had to put on their tables. Now, things have changed, and the rich started to prefer barley and rye for the health benefits. Prepared with wheat flour, "peksimat" is an unleavened pastry served in slices. As it can be conserved easily, peksimat was a popular food, especially for travel and wars. Derived from a Persian word, "beksimat" means "solid bread." It is also called "peksimeti" in Greek. It was generally served to soldiers and consumed along with stews by sopping. Bread is a holy food. A Turk who comes across a piece of bread on the street takes the bread to a higher spot after kissing the food first. People in the pasts called bread "nan-ı aziz" (sacred bread). Believing that Jesus Christ blessed bread, Christians integrate it in their communion rituals. In fact, the Church experienced pitched battles on the issue of whether the bread should be leavened or unleavened. At one time, there were bread enthusiasts just like water enthusiasts who went out looking for a source. Gourmands were willing to go to bakeries in faraway neighborhoods just to be able to buy the best bread baked in a wood fire. Attributed to Marie Antoinette, although it was actually a passage from a novel by Jean de La Bruyer, the phrase "If they have no bread, let them eat cake!" became famous. People do not appreciate the worth of bread when it is abundant, but only when war breaks out. U.S. President Herbert Hoover once said: "It is cannons, which speaks first in war, but it is bread that has the final word." In the 16th century, the population of Constantinople exceeded 100,000, which corresponded to a daily wheat need of 35-40 tons. During the harsh winter experienced in 1621, the Bosporus froze and the cost of 1 kilogram of bread increased to 60 coins. Due to the war with Russia in 1828, routes were closed and Constantinople was deprived of grains. The first population census was conducted then to be able to calculate the daily need for bread in the city, and it was found that 360,000 people lived in the city. The daily amount of wheat given was 900 tons before the Ottoman-Russian War in 1828. However, the army's need also increased with the war. Officials attempted to supply wheat from Anatolia. For example, they demanded 3,000 camel-loads of wheat from Kayseri. However, there were only 300 camels in all of Kayseri, and the attempt failed. Then, the government applied to the reserve store of grain in Constantinople's Çukurbostan neighborhood. As the products, which should be replaced with fresher ones every year, were not replaced, all the grain rotted. Grains such as corn, rye and barley were accumulated as much as possible and sent to mills to be ground into flour. Escorted by soldiers, the flour was distributed to people in front of mosques, churches and synagogues. The bread, which poisoned all who ate it, was described by Ottoman historian Lütfi Efendi: "As thick as a fist, the loaves were coal black. Perish the thought! They were hard to swallow!" White bread became the most precious product of the time after the incident. During World War I, bread distribution was done by exchanging vouchers, but the quality was considerably impaired. Flour used in bread-making began to be made from broom corn, corncobs, a little maize and barley in addition to corn in very small amounts. As the dough fell to pieces when cooked in an oven, they used pans to cook it. However, even that poor-quality bread was not enough for the people, and officials had to make bread using an unknown mixture. After a long time, it was understood that the mixture contained a kind of mud used in brick and tile production. It is said that Grand Vizier Talat Pasha also ate that bread, and it was the favorite bread of Enver Pasha, who continued feeding his horse white bread. Although Turkey did not fight in World War II, the Turkish military was ready and waiting. What is more, a huge famine occurred in those years. Thus, many products were taken by the government. Bread distribution was conditioned on vouchers, and quality was impaired. While it was 300 grams per capita until May 9, 1942, the amount was decreased to 150 grams afterward. At the very beginning of the war, Hitler bought great amount of grain and nuts from Turkey at high prices. Fortunately, he did not buy any chickpeas. People ate chickpeas to get enough food. From coffee to any dish, all kinds of food began to be prepared with chickpeas. Bread card implementation continued until mid-1946. Those in cities who had relatives in villages visited them to be able to eat as much bread as they wanted. It was not just bread that could be bought with vouchers; products such as flour, sugar, gas oil, canvas and rubber shoes could also be bought with carnets, a kind of certificate. If one did not have carnets, they had to pay 100 coins to be able to buy bread, whose actual cost was 18 coins. Carnets were distributed by local authorities in villages and neighborhoods. Tragic scenes of the country's recent history include stampedes in front of bakeries - people hopelessly waiting for bread to feed their children and selling their carnets. Most of the products that were taken from society for free or cheaply, rotted in storehouses as they were not used or were thrown into the sea or rivers, leading to famine.